Completely transform your Columbus kitchen with new quality quartz countertops from The Granite Guy! 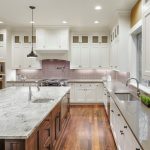 There are a lot of kitchen countertop options on the market today, from stainless steel, glass, or concrete, to wood, travertine, laminate, or tile. How do you know which one is best for your home? We’d like to suggest that you consider quartz. Why should you buy quartz countertops for your kitchen counter or bathroom vanity? The short answer is that quartz countertops are some of the most beautiful, strong, and sanitary options for bathroom and kitchen countertops out there. As strong and durable as granite countertops are, quartz countertops are even stronger. Quartz is literally one of the strongest materials on earth—one of the only things that is stronger than quartz is a diamond. Quartz is also very versatile; it comes in an endless variety of colors, allowing you to adapt it to any type of home décor. Quartz countertops will not stain, are easy to clean, and are resistant to bacteria. They also don’t require sealing, like many types of granite countertops. At The Granite Guy, we can help general contractors and homeowners in Columbus, Ohio pick out the perfect color and style of quartz countertops for any home. We hope you’ll choose us to add great value and beauty to your home in a simple and affordable way. Contact us today for a free estimate on your new quartz countertops.